US corporations are enjoying some of the lowest borrowing costs in history. Even the more leveraged (high debt to earnings ratio) large and middle market companies are "fighting off" lenders willing to provide cheap credit. Junk loans now yield 3-5% and spreads are continuing to tighten. Existing loans are being "repriced" (converted) into debt with lower rates and looser covenants. 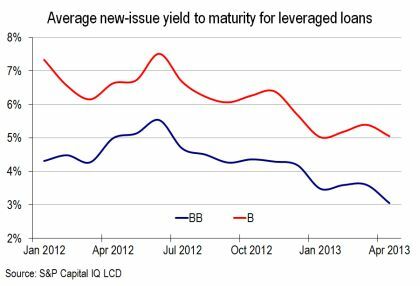 LCD: - Falling new-issue spreads spurred a new round of opportunistic deal flow. In April, issuers cuts spreads on $36.7 billion of institutional loans, up from $24.7 billion in March. In all, issuers have now repriced $155.7 billion of loans, or 28% of the S&P/LSTA Index, by 115 bps on average. While this development is great news for small businesses and the US economy as a whole, it shows that credit may be approaching frothy levels. All this new liquidity from the Fed has to end up somewhere.